In yesterday's post I talked about my first real Christmas tree in a long time. What I was meaning was my "main" tree. I've actually had a small tree in my bedroom for a few years. I use to get a small potted variety. 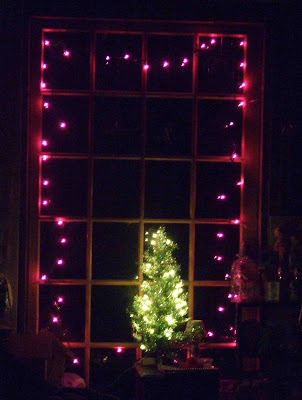 Last year I got this cute, retro style of tree in green, and added these cool purple-pink lights to my window. I've repeated it this year. I love the look! 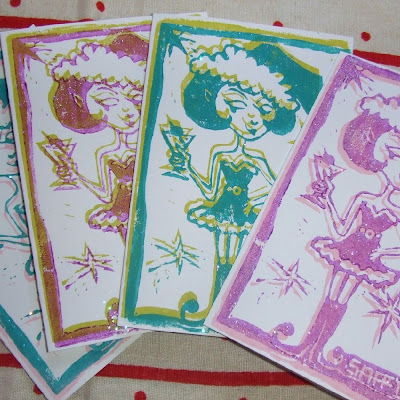 I printed up some more of my Sassy Elf Christmas cards today. They're available at my Etsy shop. 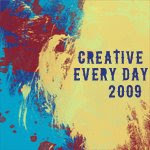 I must get my new design ready, carved, and printed soon... like tomorrow!! 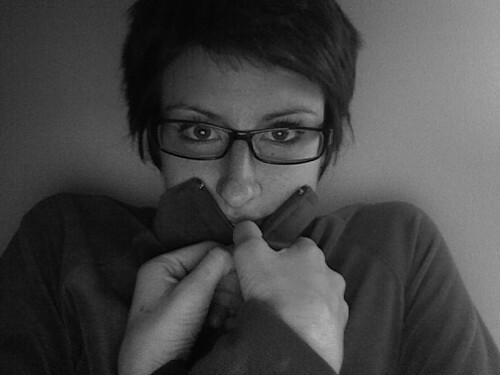 I thought I'd get it done today, but now it's pretty late and I've got some package preparations to do. Brad will have to do the mailing for me, since we've only got one vehicle shoveled out. Oh darn, I've got to stay home! I actually enjoy it. Some times I just need a break from the social scene at the school. Snow's a great excuse! Wow you have so much snow! It looks so pretty - as do those sassy elves! Oh, those cards are fun!!! I love your Christmas pics!! !